Lucja’s Pinal Airpark Trip – EHFC Members Talking! I just returned to Ithaca after a trip to Scottsdale, Arizona. I was attending an academic conference, but Walker (my husband) and I took a few days beforehand to do some sightseeing. Apart from the obligatory road trip to the Grand Canyon and an ATV tour of the desert – both highly recommended – we also went flying. At the suggestion of an East Hill member (thanks Justin!) I decided to rent a 172 and go on a sightseeing trip with an instructor. I decided the destination would be Pinal Airpark (MZJ), one of the famous airplane graveyards where airliners are stored in the desert to keep them in good condition. Pinal is not easily accessible to the public by road; apparently the owners of the storage facility are not keen on turning it into a tourist attraction, and I can understand their choice. However, MZJ is a public airport, so it is possible to fly in. There is even supposedly – per Airnav – an FBO on the airport, but when I talked to the people I was renting from it appeared the best idea was just to land, do a taxi back and take off again. Pinal also has the advantage of being 73nm from Scottsdale – an easy trip, not too long and not too short, with no high terrain to worry about but allowing for a nice view of the entire valley. Planning the trip before I left for Arizona was pretty simple; I just had to identify a place to rent a plane. There was no shortage of options, since aviation and flight training are huge industries in the area. After a bit of online research, I settled on Southwest Flight Center, on the SDL airport. Their website gave me the impression that they were focused on serving pilots who fly for fun rather than a career-oriented school, so I figured they would be a good fit for me. My impression turned out to be 100% correct, and I had a very positive experience working with them. Everyone I interacted with was helpful, courteous and accommodating, and everything was well-organized so I always knew what to expect. They have a range of planes available for rent; I decided to go with the most basic of their 172’s, since I didn’t want to spend time being confused by a G1000 when I should be looking outside! On the day of the trip, Walker and I arrived at the SDL airport a little before 8am. It was already getting warm, although it was the proverbial dry heat. The typical daytime METARs I saw there had temperatures in the 30s and negative dewpoints! 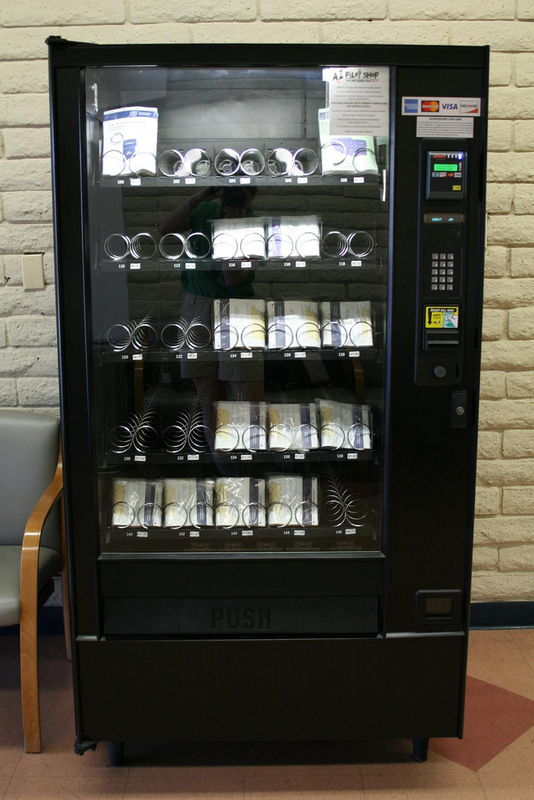 In the lobby of the building, we found a vending machine selling sectional charts, which I thought was both funny and a great idea. We met my instructor Tonie, got a weather briefing just in case (more to keep track of NOTAMS and wind rather than, you know, clouds…) preflighted the plane and off we went. The plane we flew – N3514U – was a 172S, similar to the ones we fly at East Hill but with a few differences. The biggest one was that it has a fuel injected engine. So, no carb heat to pull (or forget!) at strategic moments, and a slightly different starting procedure. Honestly, the biggest differences in aircraft handling came from the weather conditions – the heat meant a noticeably longer takeoff roll and a less-than-impressive climb performance. I asked Tonie to help with the radio communication to reduce my workload and allow me a fun sightseeing experience rather than a full-on intensive lesson. She was super-helpful and it was obvious that she is a great CFI. The trip started off with a southbound transition through the PHX Bravo (i.e. Class B) airspace. I had never been in a Bravo before, so I was a little anxious, but Tonie helped me and it turned out to be a painless process. The Phoenix Approach controller was polite and helpful, and the airspace was actually not that busy; we must have been flying at a slow time of day. We transitioned just to the east of the PHX airport at 4500 feet and got a great view of the airport itself. After that, we continued with flight following to Pinal – first we were talking to Phoenix Approach and then to Albuquerque Center. 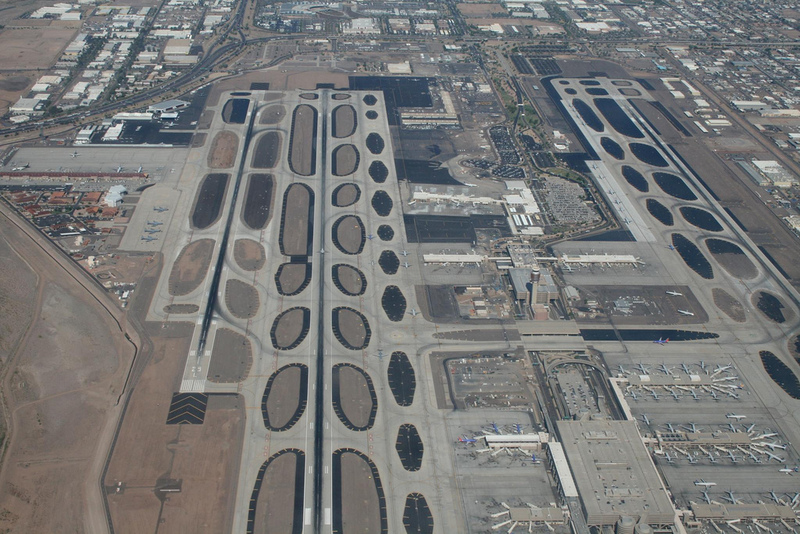 There is a tremendous number of airports in the area (take a look at a sectional on your iPad or in SkyVector! ), so it is essential to watch out for traffic of all kinds. However, again, it was not too bad. Transitioning over Phoenix Sky Harbor Airport, southbound. 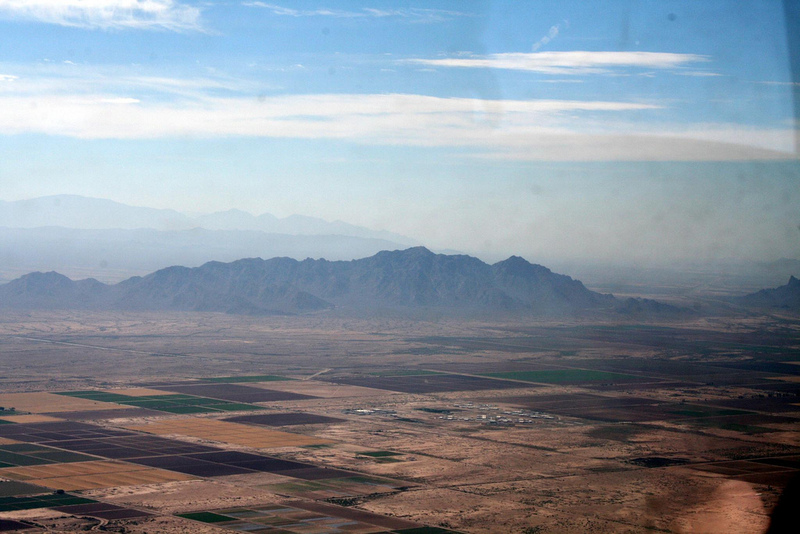 At Pinal, we landed and did a taxi back as planned. It was surreal to see all these huge airliners parked in the desert, in various states of disassembly. Some looked completely airworthy and seemed to be in temporary storage only, while others were in various states of disassembly. We saw a few that were propped up on stacks of pallets, reminding us all of the classic image of cars on cinderblocks. After that, it was back to SDL via the same route. It was fun to talk with Tonie and compare flying experiences. She told me about the challenges of flying in the desert heat (apparently simulator training is big in the summer!) and about flying over the PHX airport at night when you can see all the big planes come in. I told her about engines that won’t start in the winter, about landing on grass runways and on runways that are covered with snow, and about flying around in a very empty sky in Upstate NY. Coming back to Phoenix, the PHX Approach controller had trouble seeing the altitude data from our transponder. So, we had to stay outside the Bravo and navigate our way back to SDL via a maze of airspace, avoiding both the Class B and the Deltas of other nearby airports. It worked, and I was actually glad I got the chance to do the trip both ways – once through the Bravo and once around it. We got to the airport, Tonie warned me to watch out for the sink/downdraft from the golf course on short final (! ), and soon we were on the ground. After that it was a simple matter of taxiing around to our parking space (while admiring the gorgeous red Pitts special that was taking off), and we were done. On the entire trip, we logged 2.1 hours; the weather was warm, but not too bad at altitude, and not too windy or bumpy either. You can see more of my photos from the trip on my Flickr site. All in all, it was a wonderful experience and I would recommend it to anyone. I plan to try to do similar trips whenever I travel to some other part of the US. It was a great addition to my experience as a pilot and it made me feel a lot more confident about my flying. The fact that I went up in an unfamiliar plane, in an unfamiliar airspace, and yet things worked pretty much as I expected definitely makes me feel I can take on longer trips from Ithaca and survive :). The Bravo was nowhere near as scary as I had anticipated, and apparently a 172 handles like a 172 no matter where you are (who knew?). Thanks for sharing the adventure with us Lucja. 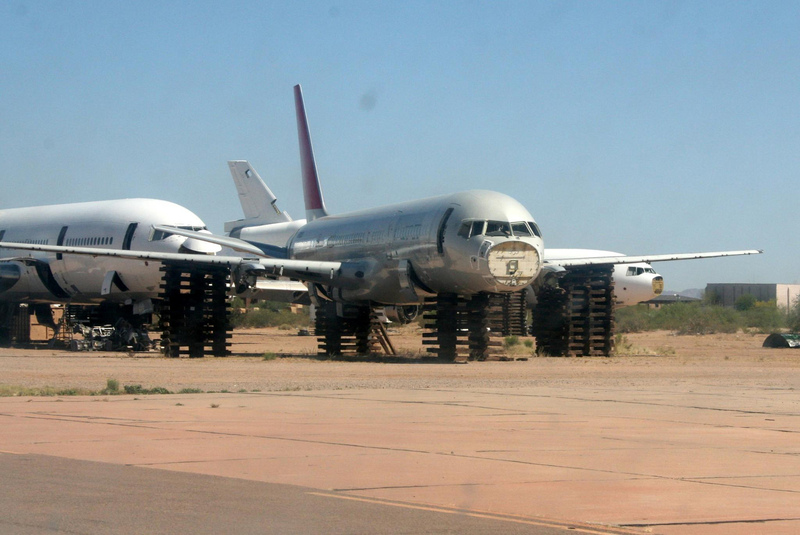 I’ve always been fascinated with aircraft graveyards, hope you have more pictures!